Decorating and fixing up the inside of our house is fun and adds to our overall enjoyment of living in our home. And while it is good to keep things up and make improvements on the inside, we sometimes forget that the outside of our home needs attention and maintenance as well. It’s important that we spend the time to take care of exterior items to preserve the good looks and value of our homes. The outside of your home is the only part of it many people will see. People who pass by, neighbors and others who see your home judge it by how it looks from the outside. By doing a good job of maintaining your property you increase it’s value and ‘curb appeal’. Our homes are getting a little older every day. The exterior siding, paint, trim, doors, masonry, foundation and roof are constantly attacked by the sun and weather. When we are sitting inside our home we don’t see and sometimes forget about how the outside looks. And because changes to the home exterior happen slowly, we typically don’t notice the slow deterioration and decline in the look of our home. But it is easy to slow and even halt this process by taking steps each year to keep your home looking in tip top shape. 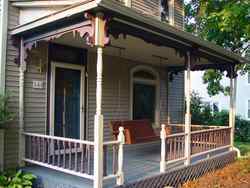 In this section are a number of ways to help you easily take care of the outside of your home. This is an excellent resource for you to use as a checklist for the things to do each year or as individual items to give you tips if you need help for a particular task. And remember to check out our pages about home and yard cleanup as well. And if you are doing a project that will generate trash and debris such as exterior home remodeling, be sure to take a look at our sections on using and renting roll off containers to make clean up easy for you. Many home improvement products produce trash and tear out items that you can’t dispose of in your regular garbage. This is often a problem in today’s ecologically minded world and the best way to stay green and get rid of your problem at the same time is to do a one time rental of a roll off dumpster or rolloff container. By planning out a little time, and doing a exterior home inspection and walk through annually, you can improve the appearance of your home, be more comfortable inside and save yourself money on utility bills, and maintain your home’s value for the future.